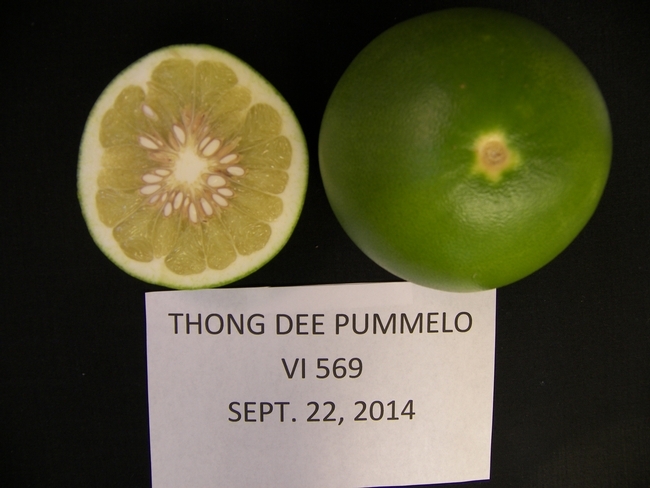 Pummelo (Citrus maxima) is one of several ancient lineages of citrus thought to have originated in China. 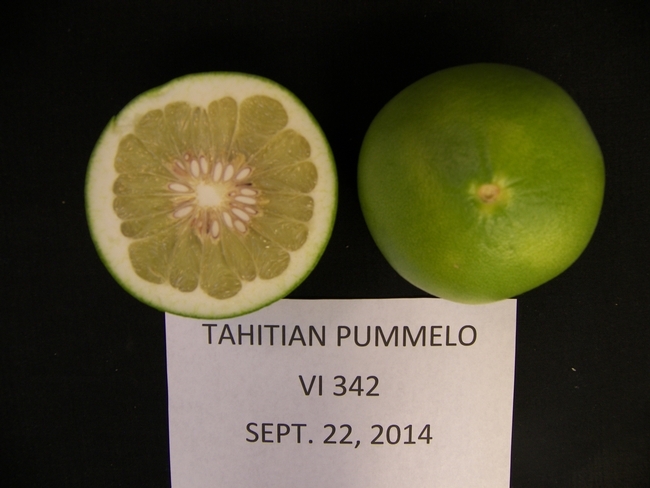 Modern hybridizations of pummelo with orange have resulted in what we know today as grapefruit (Citrus paradisi), however there are many varieties of pummelo that are great tasting on their own, and in addition they tend to lack the bitterness of grapefruit. Pummelo and grapefruit have the ability to grow into enormous trees, so be careful when deciding where to plant these trees in urban settings. The largest tree at Lindcove REC is also one of the oldest, a Brown Marsh grapefruit planted in 1963 on Troyer rootstock. Today the Citrus Clonal Protection Program (CCPP) used the Fruit Quality Lab at Lindcove REC to test several varieties of pummelo to determine whether they would be palatable and thus harvestable for the early season market. Three varieties stood out as clear taste-winners, these are Mato Buntan, Thong Dee, and Tahitian. 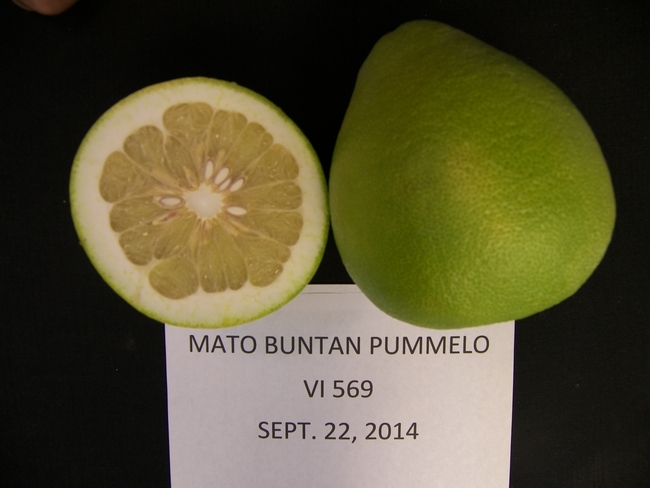 In terms of °Brix, Mato Buntan was 10.9, Thong Dee was 11.1, and Tahitian was 11.5. As for percent acid, Mato Buntan was 0.46, Thong Dee was 0.89, and Tahitian was 0.91. Thong Dee was regarded by the ad hoc volunteer taste panel as having the best tasting juice. These three varieties will be retested every two weeks for a number of months to determine the timing and duration of "good flavor". A new planting of 500 Tango mandarin trees is scheduled for this month and field preparations are well underway. Senior Agricultural Technician Jose Hernandez uses heavy equipment to dig a trench for the irrigation line. 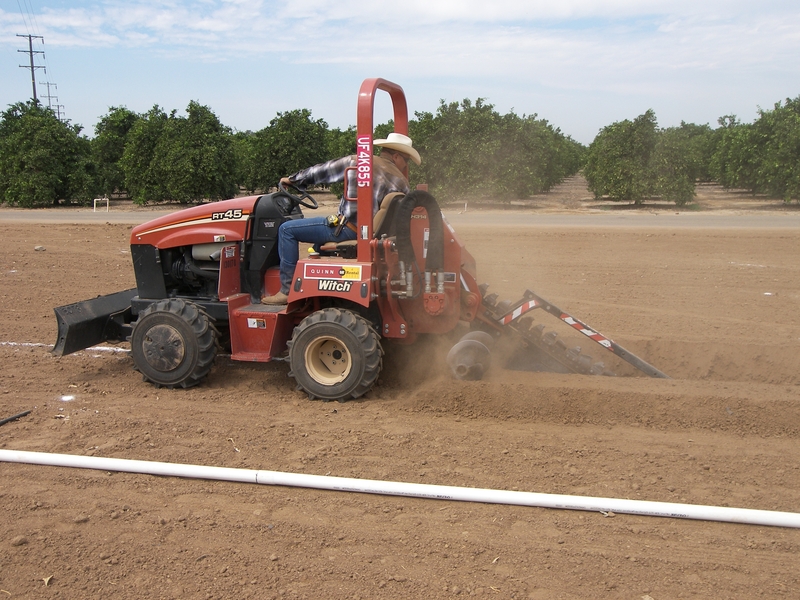 The new orchard will provide trees for insecticide trials for Dr. Beth Grafton-Cardwell's citrus IPM program. She plans to study the uptake and impact of systemic insecticides on various pests and the growth and development of young trees. Beth is an IPM Specialist and Research Entomologist with the University of California, as well as the Director of Lindcove Research and Extension Center. For more than 20 years Beth has been carrying out pesticide trials to determine the efficacy and suitability of selected chemical formulations for use against citrus pests in California. To learn about key pests of citrus and pest management tools and information, log on or subscribe to Beth's Citrus Bug Blog. The trees were propagated here at Lindcove REC. Center staff grew the Carrizo rootstocks from seed in the greenhouse, and budded the trees with budwood purchased from the Citrus Clonal Protection Program.